Sen. Rand Paul says violence that plagues lower income neighborhoods is "not a racial thing" but a "spiritual problem"
Republican presidential candidate Sen. Rand Paul bashed the "failed liberal policies in Chicago" during a visit to the city's South Side on Wednesday. 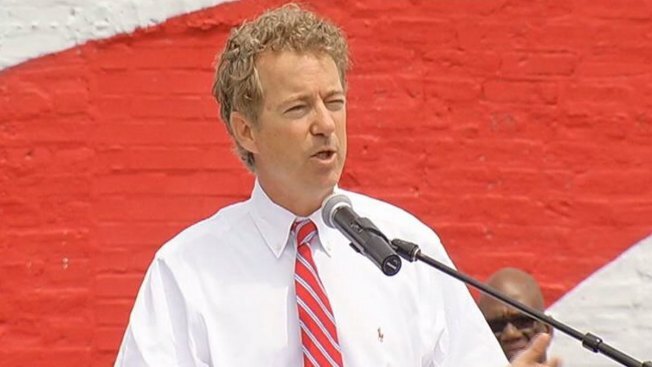 The Kentucky senator stood at a "Stand With Rand" rally at Project HOOD with South Side Pastor Corey Brooks and said the violence that plagues lower income neighborhoods is "not a racial thing" but a "spiritual problem." "If we want our neighborhoods to rise up again, if we want our kids to rise up and see a better day, if we want the violence to end, everybody must hand in hand seek an inner grace," he said at the event at the home of New Beginnings Church, at 6620 South King Dr.
Paul spoke of "unequal economic opportunity, failing schools and the broken criminal justice systems that plague cities all across the U.S., including Chicago." He also headlined an event with the Illinois Policy Institute Wednesday afternoon at 1871 in Chicago’s Merchandise Mart and later attended the DuPage County Lincoln Day Dinner in Lisle. "Too often when Republicans have won, we've squandered our victory by becoming part of the Washington machine," he said as he officially kicked off his bid for his party's nomination for 2016. "That's not who I am." Paul, a tea party favorite and frequent antagonist of leaders of his Republican Party, is ready to test how much change voters want, both for their government and for the GOP. He said that he wanted to be part of a return to prosperity for all Americans. Hope and opportunity are slipping away, he said. Paul, the son of former Rep. Ron Paul, is a frequent contrarian against his party's orthodoxy, questioning the size of the U.S. military and proposing relaxation of some drug laws that imprison offenders at a high cost to taxpayers. He also challenges the GOP's support for surveillance programs, drone policies and sanctions on Iran and Cuba. He most recently made headlines as he commandeered the Senate floor and delivered a nearly 11 hours-long protest against renewal of the Patriot Act, calling the post-Sept. 11 law government intrusion on Americans’ privacy.